D: If you are working on a budget (as most of us are) be sure to set aside a reasonable amount of money for your location. Locations and food for cast and crew usually tend to be the most expensive aspect of shooting a film. If you are just starting out and have limited funds, think about Hitchcock’s Rear Window as an example – try putting your character in one place for starters, and then try to unravel the story from there. Sometimes all it takes is one location and a great character. But with saying this, I do believe that shooting on location is a great way for new filmmakers to understand the process and also a way to learn how to organise your crew and your time. How to find your location? K: Student houses can be a clear giveaway – so can the holiday photos of you & your mates plastered across the wall, so heed this advice! The fire door signs and shatter resistant glass will signpost your film as a student project and therefore instantly less professional than if you’d used another location. I did some pre-selection of student films at a film festival last year and it’s incredible how much difference a location makes to the reading of the film. Even just asking friends/family to borrow their houses, or renting a house for a day will be worth it to make your film more realistic. D: Kat has a point – but in my experience, student accommodation can sometimes be the only answer. If this is the case, make sure you ask about filming and get permission and find time to shoot when people are not sleeping or resting. D: A lot of film schools and academies tend to have their own studios – some smaller, some bigger. It would be worth calling them up and going on a recce to see if any of their studios would fit in with your project. Film school taught me how to be resourceful and create the space I need in a studio – your imagination has no boundaries! Extra point from D: Why not contact some art schools and speak to young designers or art directors to collaborate? Adding people to your production can definitely be a blessing because it adds another layer to your project – somebody else’s input. 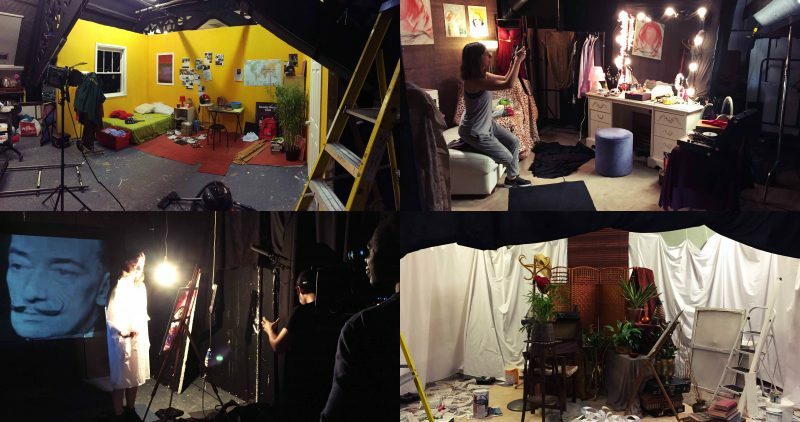 Many artist would love to have the opportunity to dress a set and make it look good for you on camera. D: In my experience with the filmmaking community, Facebook groups have shown to be one of the most effective ways of actually reaching people you need for your project. After some time, you start to recognize the people you have worked with or have heard about and a lot of them have had an ample amount of experience. Everybody today spends time on Facebook and Instagram so you will definitely meet the people you need. K: Also, if you’re stuck for location ideas, posting on local groups for suggestions can help a lot. Maybe attach some photos of location inspiration, and hopefully people will point you in the direction of the locations you need. Also, you can utilise everything from Google Images to Pinterest to help communicate your location ideas to people who know the area. Even comparing it to other films in that genre can help you find a location that could work for you. K: If you can’t find rates online or they don’t have an email address – don’t give up! Enquire at locations on the phone to see if they are available/how much they are. It can save you time by getting instant responses rather than waiting for emails if you’re on a short schedule. Don’t wait too long to contact venues either, otherwise you could find somewhere ideal that you find out is out of your budget or unavailable when you want to shoot. D: You need to speak to your Director of Photography, your Art Director or your Producer and explain to them your vision. You as a team need to start scouting for locations, looking through prices and spaces that would benefit you the most. If you are searching for locations through websites like AirBnB always make sure to ask the landlord if they are fine with you shooting there – and don’t forget to get a permit! What to do after you find your location? K: Never underestimate the importance of a location scout. You need to consider the space, the lighting conditions, and any issues you could have with sound (building works next door could be a deal breaker). Also, it’s easy to forget but check for power sockets! You don’t want to turn up with your whole crew complete with 3 lights that all need power outlets. Even Amazon Prime can’t get extension leads to you in time to save your shoot then. D: Power sources tend to be one of the trickiest things about shooting on location – think about it thoroughly. If you are shooting in a park, where will you charge the batteries for your equipment? And don’t forget toilets.. Toilets are a must have when shooting on location. D: Last year while shooting one of my films, we were looking for a big theatre space and my producer found this great one in Green Park. The only problem was that we could be in there from 10 to 6 only, so we had very limited time to unpack the equipment and pack it again so we could leave by 6. If we had found the location a bit earlier we could have stayed longer – mostly because they had already rented it out for an evening class! K: How will everyone get there? It’s easy if its near public transport, however, if you’re looking to shoot abroad or in a remote village in the countryside, you need to decide if it’s worth the extra cost/time. Is there a way around that? If you need to be on a beach in Barbados, can you find an alternative? Shooting inside a beach hut that you can construct in a studio is a lot cheaper and simpler. Unless its crucial to your story, try to work around it. D: When you’re scouting make sure that the location is also near a station or that there is parking for your van hire or even Uber to be able to save time and unload everything. K: It’s worth researching what permits you’ll need. For public places, such as swimming pools, you will probably need a permit and permission from various staff. I once shot a film in our student union, and we ended up needing two pieces of written permission from department heads, the bar manager’s permission, printed signs on the entrance to the bar and even after that, we weren’t allowed to shoot the bar area or bar staff. It’s worth doing your research. You’ll also need to think about location security and whether you’ll need public/traffic marshals. You’ll also have to do that trusty risk assessment, especially to minimise any risks if you’re shooting in a hazardous place. D: I had the opportunity to be a part a friend’s film two years ago, and we shot on many fantastic locations all around London. One was a very busy station, so that meant that the heads of departments had to do a safety and regulations session for about an hour and a half – make sure you check all of this in advance if you are to pick a popular location. K: Ensure you have everything prepared so that you can make the most of your allotted time on location. Planning ahead and making your call sheet as precise as possible will help you keep to time and get the most from your location. D: Many different things can happen or go wrong when filming on location, so make sure you give yourself time to get all the coverage. Your AD needs to have a strong voice and be very organized and prepared to deal with any situation, especially when filming somewhere for the first time. Also take into account that your cast and crew also need to rest and not be stressed. K: Hopefully you’ve found these tips handy, and we’d love to know how you get on! Send us a link to your short film or let us know your experiences below. 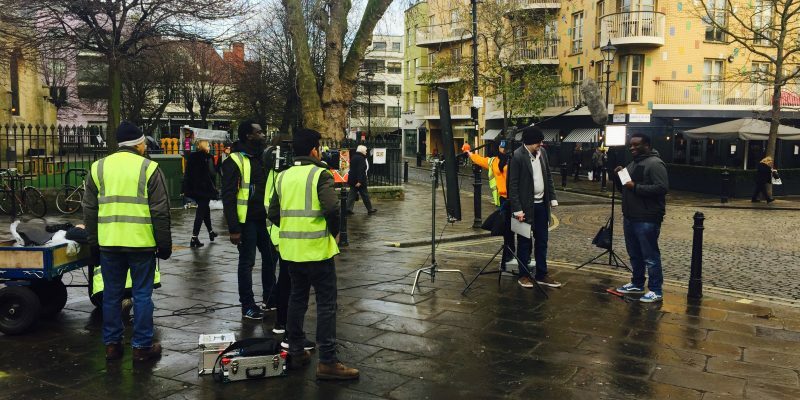 Why not check out Raindance’s Lo-To-No Budget Filmmaking Course? Find out more about Dušan Mrđen. Read our Ultimate Guide to Creating Film Genre here. Thank you in advance for those tips. The information was very useful to continue on my journey of finding a location for my film. Thank you in advance for those tips. The information was very useful to continue on my journey of finding a location of my film.